Events – Page 18 – TAMPA PRESERVATION, INC.
Friends of Tampa Union Station is pleased to announce that the Historic Tampa Union Station will be the site of events for National Train Day, on Saturday, May 8, 2010. The event runs from 12:00 noon to 5:00 PM. Admission is free. – History and railroading exhibits featuring items from the Tampa-Hillsborough County Public Library/ Burgert Brothers Photograph Collection, Tampa Bay History Center, Florida Railroad Museum, the Florida Coalition of Rail Passengers, City of Tampa Historic Preservation and Urban Design, National Association of Railroad Passengers, the Atlantic Coast Line & Seaboard Air Line Railroads Historical Society, Florida historical groups, Friends of Tampa Union Station, and others. National Train Day celebrates America‘s love for trains with events across the country. This year marks the third annual celebration with large-scale, family-friendly events that provide opportunities to explore interactive, educational exhibits that bring to life the rich narrative of how trains have transformed America and will continue to do so in the future. National Train Day marks 141 years of connecting travelers coast to coast and commemorates the day the first transcontinental railroad was created. On May 10, 1869, in Promontory Summit, Utah, the golden spike was driven into the final tie that joined 1,776 miles of the Central Pacific and Union Pacific railways, transforming America by creating the nation‘s first transcontinental railroad. This event at Tampa Union Station is one of many which are happening simultaneously around the country. More than 140 local celebrations took place in 2009 and Amtrak expects even more in 2010. National Train Day in Tampa is sponsored by the Florida Coalition of Rail Passengers, Friends of Tampa Union Station, the National Association of Railroad Passengers, the City of Tampa, and Amtrak. More information on National Train Day 2010 can be found at the www.nationaltrainday.com website and the Florida Coalition of Rail Passengers website: www.fcrprail.org. Friends of Tampa Union Station is an all-volunteer organization which advocates for the preservation of historic Tampa Union Station as both a landmark and transportation asset. The organization was founded in 2008 by a group of citizens eager to preserve Tampa Union Station‘s colorful past and to assure its future. Friends of Tampa Union Station, on the web at www.tampaunionstation.com, was founded in cooperation with the City of Tampa‘s Growth Management & Development Services Department—which administers Tampa‘s historic preservation program and owns and operates Tampa Union Station—and the Florida Coalition of Rail Passengers. Friends of Tampa Union Station has established a permanent endowment fund for the ongoing restoration of Tampa Union Station at the Community Foundation of Tampa Bay and raises funds for it through an engraved brick program and other initiatives. To date, over $31,000 has been raised for the endowment, helping to ensure that Historic Tampa Union Station is preserved for future generations to use and enjoy. The Preservation Roundtable will meet on WEDNESDAY, APRIL 7TH AT 9:00 am at TAMPA UNION STATION. All Tampa Bay area preservation-interested residents are welcome to attend. Please contact TPI for any additional information. 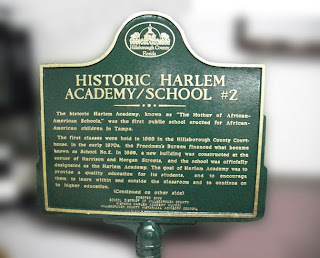 Hillsborough County Public Schools and the Historic Harlem Academy Alumni invite you to the Historic Harlem Academy Marker Dedication at 4 p.m. Thursday, February 26, 2009 at 506 E. Harrison St., Tampa, FL 33602. A reception will follow at the Raymond O. Shelton School Administrative Center located at 901 E. Kennedy Blvd., Tampa. Please RSVP to Kristin Jernigan kjernigan@sdhc.us or 813-272-4055. 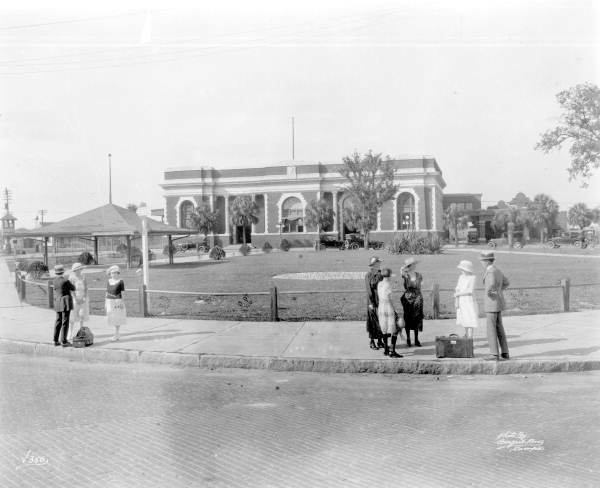 The historic Harlem Academy, known as “The Mother of African-American Schools,” was the first public school erected for African-American children in Tampa. The first classes were held in 1868 in the Hillsborough County Courthouse. In the early 1870s, the Freedmen’s Bureau financed what became known as School No.2. In 1889, a new building was constructed at the comer of Harrison and Morgan Streets, and the school was officially designated as the Harlem Academy. The goal of Harlem Academy was to provide a quality education for its students, and to encourage them to learn within and outside the classroom and to continue on to higher education. In 1892, Harlem Academy was destroyed in a fire. Thomas McKnight and other members of Tampa’s African-American community raised funds to rebuild the school. St. Paul AME and other churches provided space, until a new building was completed in 1895. This structure was replaced by a brick building in 1912. Many prominent African-American citizens were involved with the school. Christina A. Meacham and Andrew J. Ferrell, Jr., once principals of Harlem, had schools in Hillsborough County named in their honor. The Harlem Academy closed in 1964, thus completing its ninety-six year contribution to the education of African-Americans in Tampa. Although the physical structure was later demolished, the heart of Harlem Academy lives on in the teachers, students and staff that graced its classrooms and halls.